Last Sunday, I saw Neil Gaiman speak live at the New Yorker Festival--read about it on Big Island Rachel--and to honor my most favorite of the writer-types, I'm going to take some time out of our regularly scheduled comics lineup to review some of his work. Since I was fortunate enough to hear Gaiman talk about his more famous projects, such as "Coraline," "Stardust," "American Gods," and the "Sandman" series, these reviews are going to be a bit more behind-the-scenes than usual ('usual' being Big Island Rachel is just lying making educated guesses about what authors may have been thinking). Gaiman described his book "Coraline" as "a horror story for five-year-olds." It concerns a little girl named Coraline who discovers that a doorway in her new house leads to another house, much like her own, except the other house is everything a little girl could hope for: magical moving toys, beautiful clothes, great food, and a mother who wants to love her forever and give her everything her heart desires. All Coraline has to do in order to stay in the other house with the other mother forever is let the other mother replace her eyes with shiny black buttons. 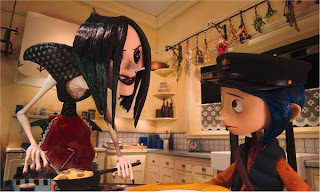 Coraline refuses, and goes back home to her real house, only to discover that the other mother has stolen away her real mother and father, and it's up to her to get them back. The origins of this story go back to Gaiman's daughter Holly, who, at five years old, would sit on his lap and dictate a series of stories about a little girl named Holly who comes home to find that her mother has been replaced by an evil witch. The witch always ends up throwing Holly in the cellar where Holly encounters what Gaiman describes as "not-ghost children. I never understood if they were ghosts or not, but Holly, at 5, seemed to know quite well what they were." Holly and the not-ghost children would then go to America to find out Holly's real mother. "Holly's Story," as Gaiman titled the collaboration, was initially published as a comic book at the Taboo imprint, but the idea stayed with him. "I wanted to write a book that the Hollys of the world would like--a horror story for five-year-olds." Not surprisingly, the book, now called "Coraline," languished at the publisher's for years, his editors being reluctant to publish a children's book where evil witches want to sew buttons into little girls' eyes. Eventually, Gaiman urged his editor to read the book to her two little girls, ages 5 and 7 at the time. He told her, "If they're scared and traumatized, you can forget about it." The editor read the story to her children and they weren't scared or traumatized, so "Coraline" was published. 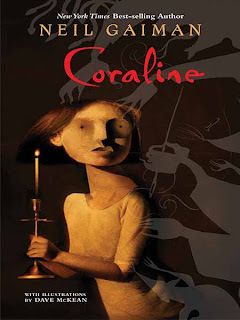 Several years later, Gaiman ran into the editor and her now-twelve year old daughter, and he thanked the girl for not being scared of "Coraline," else the book would have languished forever in publishing limbo. The girl said, "No, I was terrified of that book! But I knew that if I told anyone, they would stop reading it to me, and I had to know how it ended." There's no doubt, "Coraline" is a creepy little story. In subject matter, I'd compare it to H.P. Lovecraft, especially in the way that none of the REALLY creepy stuff is ever explained: why the door in Coraline's house leads to another world; what that other world is; what the other mother is (and if there are more of her kind hanging around)(ooo, I just got chickenskin). Gaiman hints at mysteries and horrors beyond the borders of the story we're told. There is already a lot to disgust and scare us, nasty little details like the button-eyes and the talking rats in the attic. But the genius of this book is it's ability to leave the reader with big gaps in our knowledge of this other world, gaps that we can't help but fill in after we close the book, and everyone knows that the things we imagine are always worse than the things that are. We're haunted as much by the empty spaces in "Coraline" as we are by the monsters that leap out of the shadows. In a way, it's almost more frightening to read this book as an adult. While children are used to feeling out of their depth in a weird and confusing world, I find that the older I get and the more furniture I acquire, the more secure I feel in my version of reality. "Coraline" takes this security away. She simply walks into the other mother's house and has to take what she sees at face value. In adult books this would be called a minimalist approach, but really it's how all children experience the world, as a stream of information without context. As adults, we tend to forget just how terrifying a lack of context can be. "Coraline" still scares me to this day because it's a story that's stripped of the comfort of context. I'm a little girl, too, groping in the dark for something familiar to catch hold of, and finding only more questions. I'm going to crawl into bed and squeeze my teddy bear very, very tightly now.